Paddling Light's Canoe & Kayak Plans: What Price Free? I've been following Bryan Hansel on Twitter for some time, but just recently did I learn about his free canoe and kayak plans. In this recent post on his blog Paddling Light, he discusses the impact upon his personal finances of giving plans away, and asks readers for advice and opinions: should he continue offering the plans for free? convert to a fully-paid model? shut down the project? His request for feedback seems thoroughly sincere, and not as if he's looking for confirmation of an already-made decision. As for the plans themselves: he has taken historical plans from a number of sources -- museum publications and books, most notably Adney & Chapelle's Bark Canoes& Skin Boats of North America -- and redrawn and digitized them. Most are appropriate for strip-building, while others would lend themselves more readily to plywood panel (e.g., stitch-and-glue) construction. The plans include classic types that would make wonderful, logical build-it-yourself projects, including a Passamaquoddy ocean canoe and a southwest Greenland kayak, but there are also some types that would draw uncomprehending stares at your local boat ramp: for example, a Beothuk canoe or a King Island kayak. I don't mock these latter designs in the slightest: I love the idea of building such unfamiliar boat types, but one must acknowledge that they are miles out of the ordinary for most paddlers. Lines plans and 3D rendering of a Coast Salish canoe, from Paddling Light. What Hansell offers for free varies from study plans to full-size lines drawings, but he also asks for donations, and has voluntary fees on a sliding scale based on the user's self-reported financial comfort. For full CAD files, he does expect fair payment for the considerable effort that he has put into creating the files. (Hansell also offers his own sea kayak designs for a fixed, reasonable fee.) The plans do not include construction details: these are primarily lines drawings. As such, they assume a good understanding of boat construction methods and a fair amount of insight and creativity to translate into actual finished boats. I value what Hansell is doing, and I have conflicting advice for readers who are interested in his plans. First: since there's a possibility that the plans could be withdrawn or might no longer be offered free, you might want to do your downloads now. Second: if you download, pay or donate what you can to enable him to continue the project. And Third: whether you download or not, take a look at what Hansell is offering and give him the feedback he seeks concerning whether and how he should continue to offer the plans. My own advice to Hansell is: continue offering a limited number of plans for free, and put fixed prices on all the others. 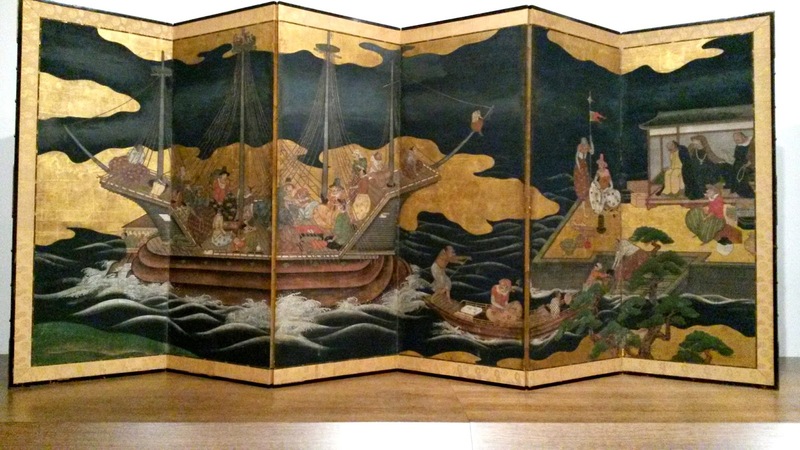 On a recent visit to the new Harvard Art Museum, I came across two lovely 6-panel painted folding screens from Japan's Edo period (also called the Tokugawa Period,1603 to 1868) containing images of Japanese small craft. 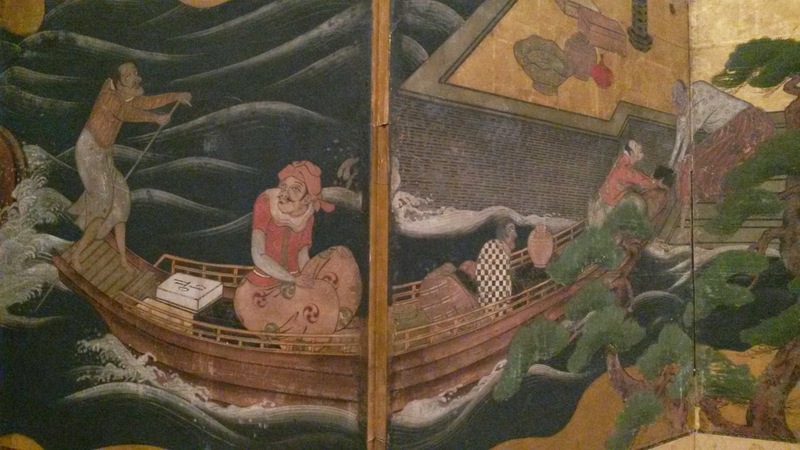 Detail of the above image, showing a small boat of Japanese appearance ferrying the captain ashore, along with some cargo or gifts. The boat's size is difficult to interpret, given the varying scales of its passengers. 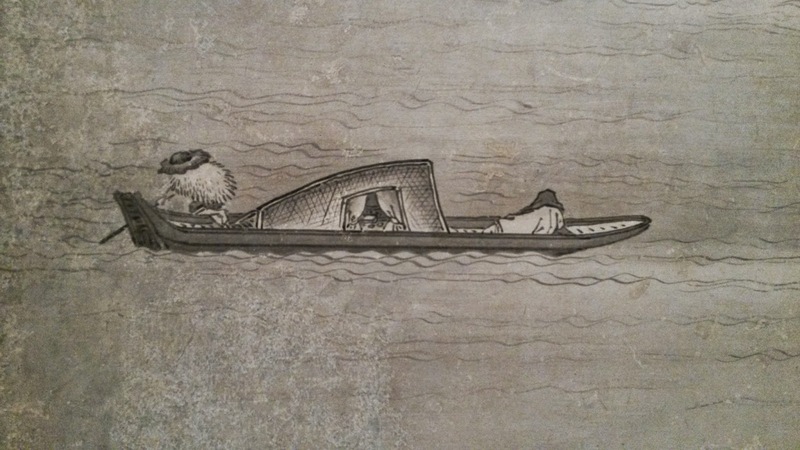 The boat is sculled from the stern by a single sculler, but again this might be artistic license. 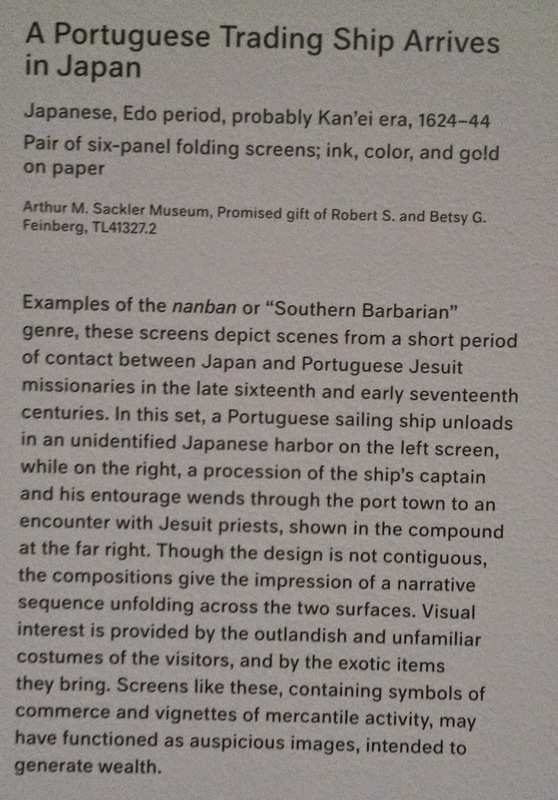 The exhibit card for the above images, which show only the left of two folding screens mentioned (the right-hand screen not being of interest to this blog). A landscape with a small boat in the foreground (third panel from the left). 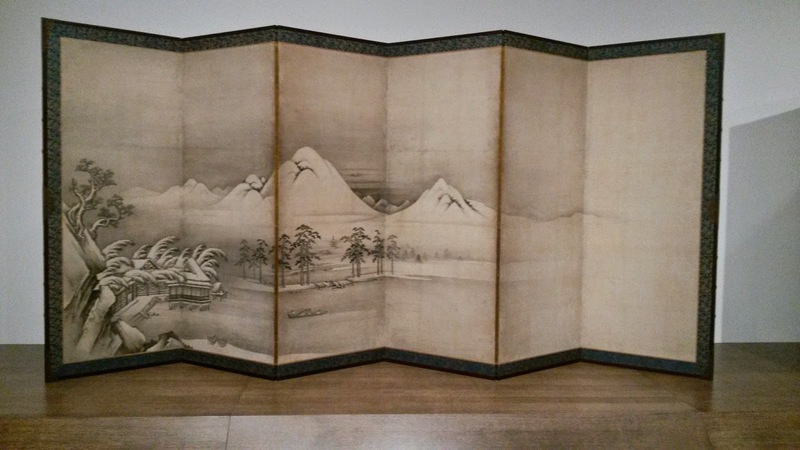 According to the exhibit card, it "tells the story of the Chinese calligrapher and poet Wang Ziyou (also known as Wang Huishi, 338?-386), who sets out in a small boat to visit his friend Dai Andao on a wintry night. Just as he reaches his destination, however, his inspiration fades, and he returns home alone without completing his visit." Dai Andao, who had baked a cake, was miffed. "That Wang Ziyou is so goddamned existential," he muttered. Detail of the above image. The figure in the stern (on the left) appears to be sculling, although his posture makes this ambiguous. It is also unclear if Wang Ziyou is the reclining figure in the bow, or if he is under the canopy and the figure in the bow is performing some other function. 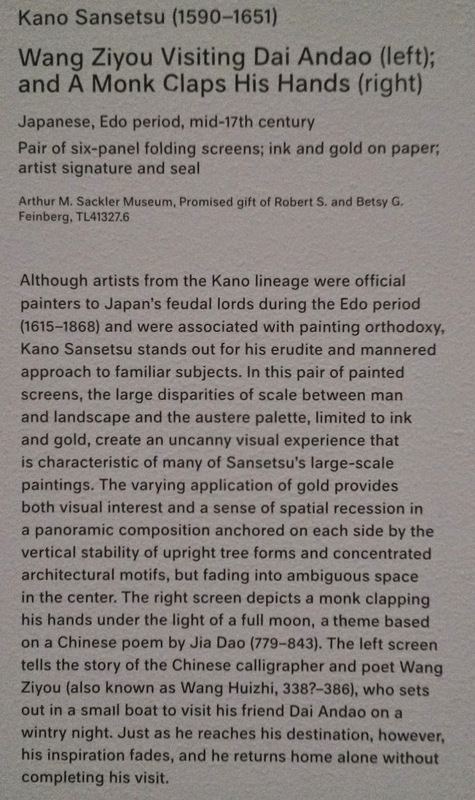 The exhibit card for the two images above. The screen shown here is the left of the two referenced, the right one not being relevant.